Capturing and encoding video for digital streaming or storing is a key requirement for the professional AV market . Users need to be able to capture video and not only send the data to the screen but transport compressed video to online resources or to storage locations for remote access or later retrieval. 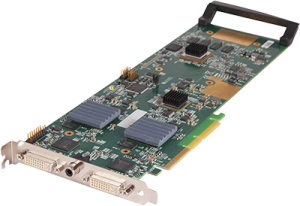 The Datapath VisionHD2-SQX is an advanced video capture card with SQX technology that allows captured video to be encoded into H.264. Featuring three independent capture channels the VisionHD2-SQX allows users to capture two high definition 1920x1200 video feeds and directly encode them into H.264 using the dedicated SQX processor. Each encoded video can be utilized by the SQX media server for distribution over a network. In addition raw captured video can be rapidly transferred to graphics hardware or system buffers for viewing or further processing. Datapath’s SQX encoding technology uses the global H.264 standard for video compression and streaming. Multiple streams of captured video can be simultaneously encoded and streamed to different locations. The VisionHD2-SQX can capture two 1920x1200 channels, the encoding engine can encode one channel at 60 fps or both at 30 fps, allowing one stream to be broadcast over the internet and another to be stored to disk. A single stream can be distributed to any number of network locations all configured through a media server. DVI Capture Supports DVI 1.0 RGB 24 bit capture to 165 Mhz. TMDS equalizer for 20m cable support. * Adapters for other types of video connectors such as DVI/ HDMI, DVI/ VGA or DVI/Component are not included with the VisionHD2-SQX but are available from Datapath, contact our sales team for details.